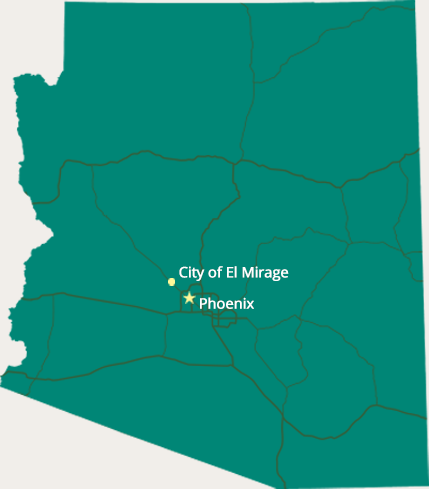 El Mirage is a modern, business-driven suburb northwest of Phoenix with the ability to attract new residents and companies in a very competitive economic development environment. Over the last several years, our goal has been to create a community that provides our residents with the opportunity to purchase any good or service without having to leave our city limits. Come to El Mirage where exceptional business market opportunities await. El Mirage has a young diverse workforce supporting a thriving and growing economy with a regional population supporting over 4 million people in the Greater Phoenix area and projected to reach 6.3 million by 2030. El Mirage has new and improved infrastructure, no development impact fees, and is a 30-60 day Pre-Approval Foreign Trade Zone Site. The Economic Development Office works closely with businesses throughout all phases of the development process. We work as a team to ensure your transition to starting, running, expanding or relocating a business in El Mirage is successful.